No, this isn’t Japan, but it did come from there. It’s an HTV vehicle taking supplies and scientific equipment to the International Space Station, and it’s about to be grabbed by the space station’s robot arm. It took off from Tanegashima Space Centre one week earlier. 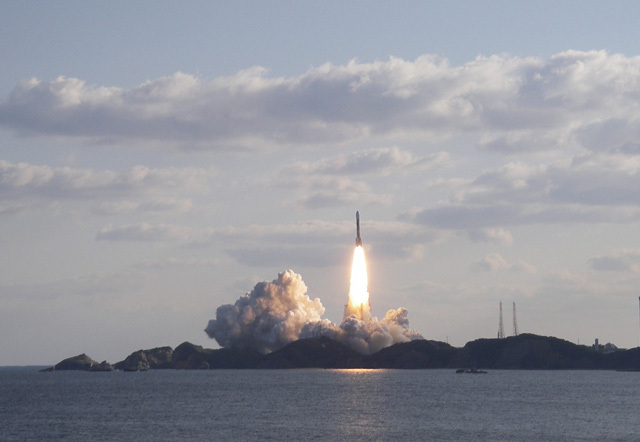 Space rockets are probably the last thing you’d expect to find on a small island a thousand kilometres from Tokyo, but Tanegashima, 115km south of Kyushu, is home to Japan’s largest space centre, and Japan’s biggest rockets. The space centre was established in 1969, and covers some ten million square metres at the south-eastern corner of the island. Not only are rockets built, tested and launched at the centre, it also monitors and controls all of Japan’s satellites, and there’s a space museum too. The biggest attraction is of course the rocket launches themselves, but these only take place a few times a year. Spectators have to keep at least three kilometres away, but you can still get a good view from one of the viewing spots recommended by JAXA (Japan’s space agency). If you do want to see a launch, be sure to book your accommodation and transportation to the island early, as these often book up quickly. The biggest draw is the H-IIB rockets, Japan’s largest. They are 57 metres tall, weigh 531 tonnes, and can launch several satellites at once, or send cargo vehicles on their way to the International Space Station. Perhaps more importantly, they make a really impressive roar and give off loads of white smoke on their way up. 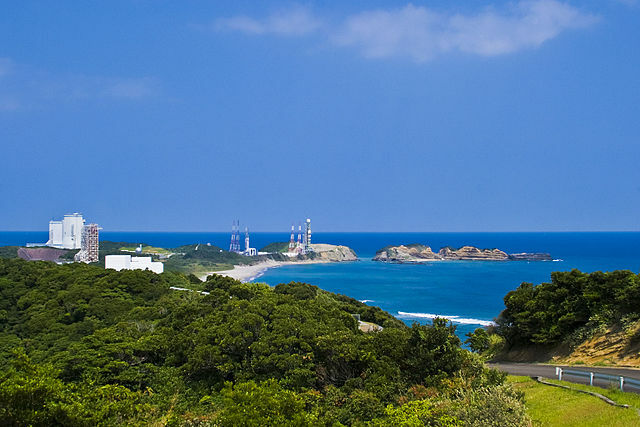 The Yoshinobu Launch Complex on Tanegashima, from which Japan’s largest rockets are launched. JAXA describe it as ‘the most beautiful rocket-launch complex in the world’, but unless you come specifically to see a launch, you’re unlikely to actually see a rocket here, as they are only taken out of the building where they’re built about twelve hours beforehand. Tanegashima’s space museum is free, and is open 9:30am to 5:30pm Tuesday to Sunday, except that it closes around the times that launches are scheduled. The highlight of the museum is a life-size model of Kibo – the Japanese experiment module on the International Space Station. There’s also a full size replica of an H-II rocket nearby – it’s 50 metres tall, or about as high as a fifteen-story building. Free Tours of the launch facilities leave from in front of the museum three times a day, and take one hour and fifteen minutes. On a tour you get to see the rocket assembly building, the launch pads, and the control centre. You are advised to book a tour as soon as you know when you will be travelling, by calling the museum on 0997-26-9244. If you can’t get on a tour, you can still view the launch pads from an observation point on ‘Rocket Hill’, or even take a look at them on Google Street View here. An H-IIA rocket blasting off, this time carrying an experimental communications satellite. 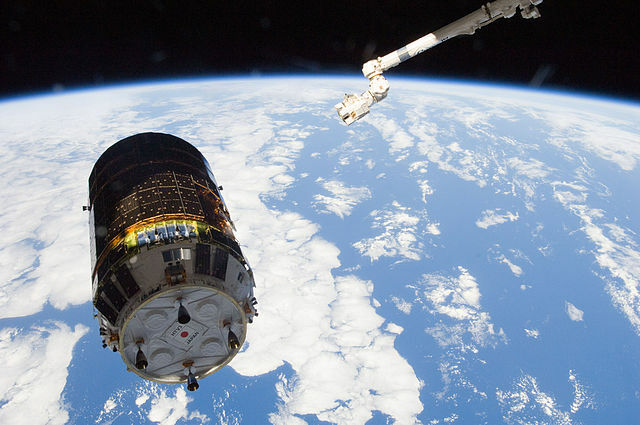 Are you wondering why JAXA decided to put its main space base in such a far-flung location? Well there are two reasons. The first is that the closer you get to the equator, the fatter the earth gets, and so the faster the planet’s surface has to spin in order to make it all the way around once a day. When you’re standing still at the equator, you’re really travelling at 1,700 km/h – you have to go to the north or south pole if you really want to stop moving. Of course you don’t normally notice this, as everything around you is going around at exactly the same speed, but when you’re leaving the planet and going into space it does make a difference – if you’re going faster before you set off, you don’t need quite so much fuel to get you up there. (If you’ve ever wondered why America launches its rockets from Florida, Russia from Kazakhstan, and Europe from French Guiana, now you know.) The other, and much more obvious reason is that if anything goes wrong and the rocket doesn’t make it into space, it will crash into the sea rather than a populated area. High speed ferries run to Tanegashima from Kagoshima several times a day, and take around one and a half hours. Here we see one of the boats that serves this route, a jetfoil called Rocket 2. 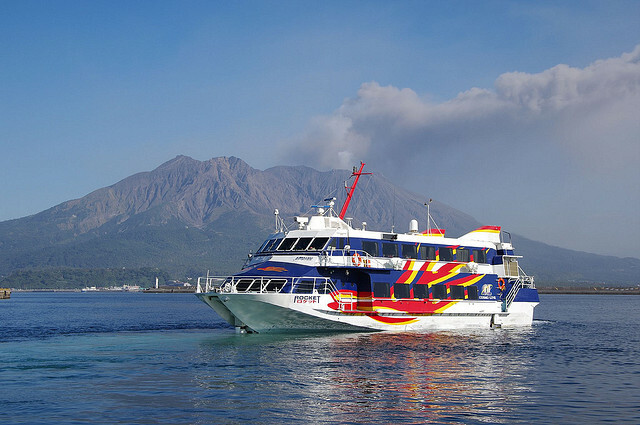 It’s just outside of Kagoshima Harbour, and Sakurajima Volcano can be seen erupting in the background. If you prefer to fly, there are five flights a day from Kagoshima Airport (30 minutes), and one a day from Osaka’s Itami Airport (one hour and twenty minutes). If you can’t make it to Tanegashima, there’s another launch complex at Uchinoura (also in Kagoshima Prefecture). Around 400 rockets have been launched from there since it opened in 1962, including one in 1970 that carried Japan’s first satellite. Nowadays it’s used to launch smaller rockets, either ones that aren’t going into orbit, or which carry small scientific satellites.